The center bead is fine silver metal clay, made from a mold taken from a goldenrod stem gall. I call it my pod bead. 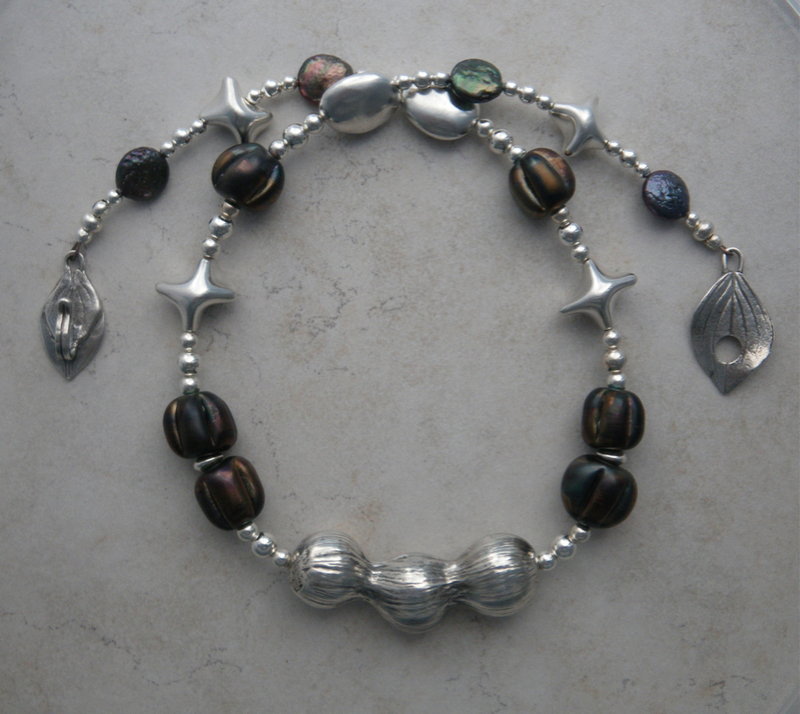 As I was trying to decide which of my other beads to include in the necklace, Sue Kennedy posted some dark glass pod beads on her blog. I went to her Etsy site and snapped them up right away. I knew they would be the perfect match for my pod bead. I love finding beads made by other artists to combine with my own. I am drawn to the work of others who like making beads as much as I do. I made all the silver PMC beads in this necklace. Two are made from molds taken from beach rocks, and four of them are the drape beads I learned to make in Fred Woell’s workshop. The clasp is one I made a while ago for another necklace. The bunch berry leaves I used in the clasp will be coming up again soon, now that it’s spring. 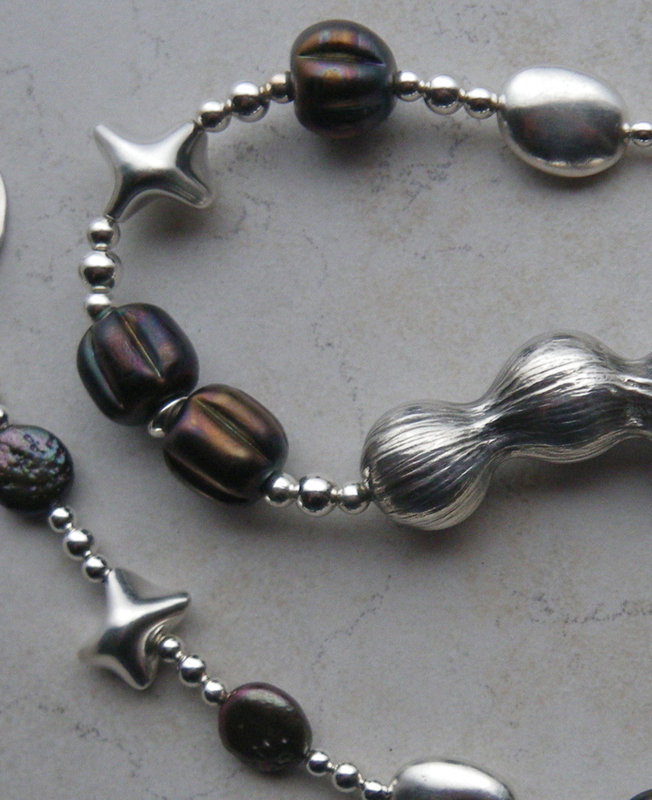 The freshwater coin pearls were just the right color match for Sue’s beads. I’m happy with how everything came together. I wish the sun had been out today for better photos. (I wish the sun would just come back out period.) I was in an hurry anyway as I took the photos late in the day. I didn’t get everything done today, but I am satisfied with what I accomplished. Clean fridge, sourdough bread made, clean closet, organized dresser, tidied up studio, suitcase packed, and now daily blog post finished! Beautiful necklace. Have a great trip! Wow, Barb! I love this necklace. 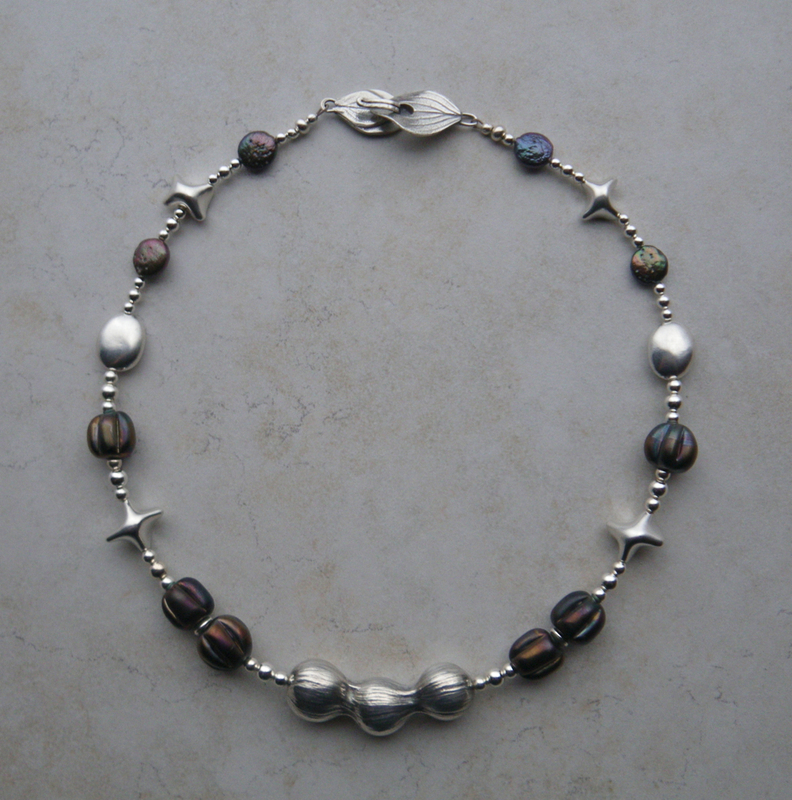 Your choice of Sue’s beads and the coin pearls really compliment the beauty of your silver beads. And the clasp is really stunning! Nicely done! Enjoy your time away! Thanks Marly. I really love these beads by Sue. Are you guys getting any spring weather yet? Warm, dry, green? It is a slow one here. Rain, rain,rain, but there are buds starting on the trees. What can you do eh? That’s life! Beautiful necklace beautiful s-in-law! Have a great trip! Thanks Kelly! It was fun seeing you guys last weekend. Sorry we had to dash off from Fritzer’s, but we were able to catch an early ride home. Susie and I will manage to have some fun together I’m sure! Stunning! I will put on my blog!!!! Have a great weekend! Thanks Sue. I was so psyched when you posted those beads, right at the time I was working on the pod necklace. They are very cool! Now that’s a busy day! I hope you slept like a log after all that industry. I’m in love with the seed pearls, BTW. Nice work. Thanks Nancy. I was pooped, but wired about my trip. On my 9m hour drive to N.Y. I pulled over for a little nap. Now I’m here ready to have a blast! oh yeah…those sue kennedy beads are perfect! is that a second gall bead, or did you disassemble the other necklace? i’m ALWAYS disassembling (cuz ya KNOW how i feel about my abilities as a beader) and wonder if others do too! i’m constantly amazed at your productivity… here’s what i hoped to do yesterday and the night before…. It was a total restring! I can never stick with the first necklace. Usually have them apart and together several times before I am satisfied. I have quite a few silver beads on hand from the good old days when PMC wasn’t so bloody expensive. Pricing will be hard to figure out. Or just hard to feel comfortable with. I can’t imagine anyone paying what I will end up charging for a necklace with so many handmade silver beads. Sue’s beads really are perfect aren’t they? the price of silver is actually keeping me from working at all…before i could just make things, and enjoy the results…now i’m quite sure that none of my ideas are “good enough” to use such a precious material….that’s pathetic. i only have 1 package left, and that also factors in-i hate to open the last package just in case i have an “emergency” and need more….what kind of emergency? i don’t know…..
Beautiful necklace Barb and I love the clasp. Very nice. Have a safe and fun trip. xo ps..mi iPad arrives today…learning curve weekend! Sue’s and your pod bead are a match made in heaven. Lovely. Thanks LeAnn. I was really happy with how well they went together! What a great combo. Do you sell our work at shows as well at Etsy? Thanks Ruth. I sell in a few places in Maine during the summer season and into fall. Then I do a few trunk shows and a holiday fair. I could definitely improve on my marketing attempts….